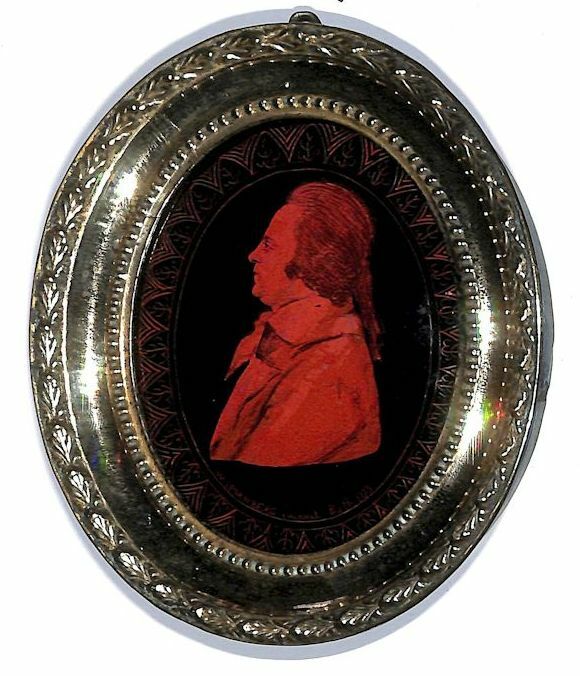 Seeking a new style of silhouette that would be noticed in the flourishing market for profile portraits during the late eighteenth century, Jacob Spornberg invented the Etruscan-style silhouette which was reminiscent of the red-figure Etruscan pottery invented at Athens about 530 BC. 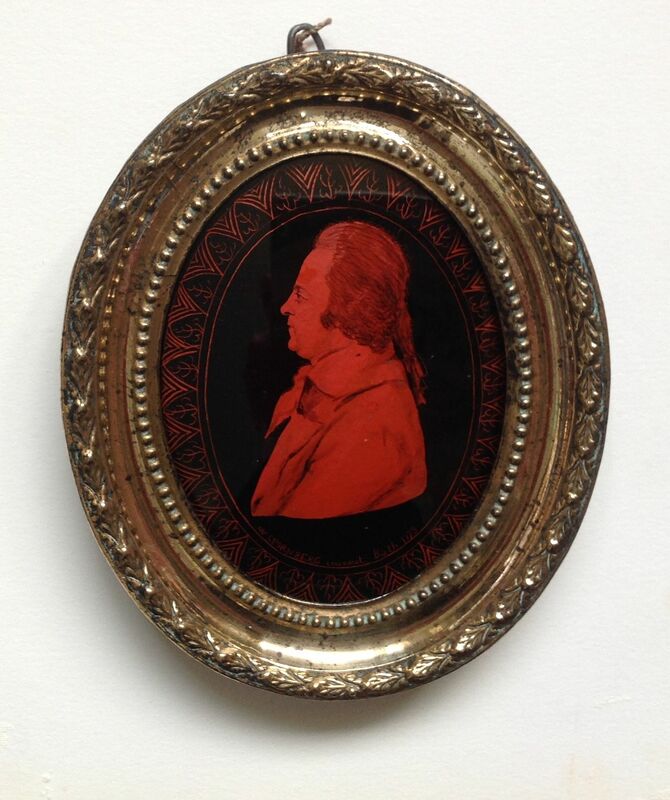 An outline of the sitter and a decorative border were initially drawn on convex glass in thin black paint against a black ground and then the whole was coated in vermilion enamel creating a striking contrast. It was a style that was soon imitated, though to lesser effect, by his contemporary Charles Rosenberg. 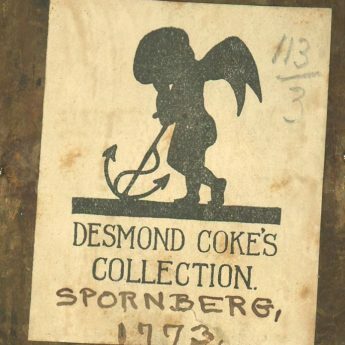 Given their comparative rarity on the market, it seems fair to speculate that this new style was not overly popular though Spornberg continued to advertise it over the length of his career. This example portrays a gentleman in a coat with deep cut lapels, a knotted cravat and a pigtail wig. 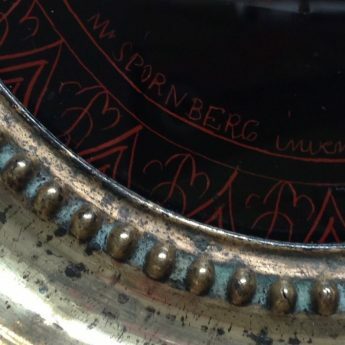 It is signed along the bottom edge of the border ‘Mr SPORNBERG invenit Bath 1793’. There is some craquelure to the face and collar but no paint loss. The silhouette is housed in the original brass-faced oval frame and is backed with Desmond Coke’s collection label. 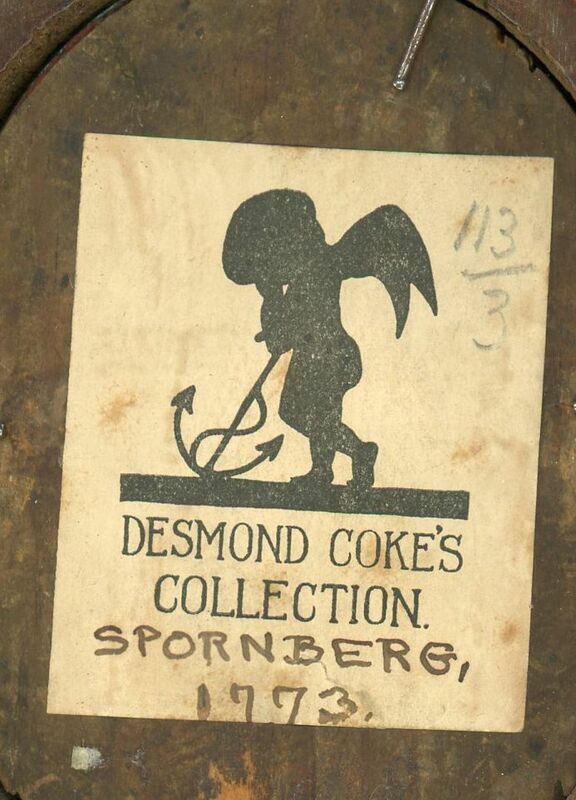 Desmond Coke (1879-1931) was given the honorary rank of Captain when he was invalided out of the Army in 1917. He took up teaching thereafter also writing stories for boys using the improbable pseudonym Belinda Blinders! 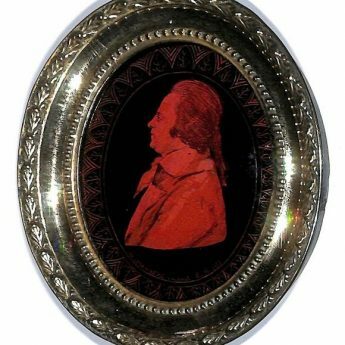 Referring to himself as ‘an incurable collector’, he collected books, antiques and paintings, some of which he bequeathed to the V&A Museum in London. Finnish by birth, Jacob Spornberg (b.1768) settled in Bath where his wife Rebecca ran a millinery shop in Milsom Street. In 1840, following the death of his wife, Spornberg emigrated to the United States to join his son.